On this page you will find the questions most frequently asked by people prior to enrolling their dogs in agility class. Please read through them, as your specific question may be addressed here. Is there any pre-requisite training or skills that my dog should have before we enroll in agility class? It's helpful if your dog has a few skills before beginning agility training. Beginner dogs always start out their agility training on a leash, but it's helpful if your dog has some type of recall. Good manners on a leash are also a plus. You will learn a lot about training behaviors during class, but anything your dog knows prior to coming to class will make the experience even more fun for you. Is my dog too old or too young to start agility training? The simple answer is no. Dogs of all ages can enjoy the fun and exercise benefits of agility. Of course the training will need to be modified and tailored for very young dogs or pets of an advanced age. And your dog would be excluded if he/she had a serious health issue. But even dogs with certain physical deficits can have fun at agility as long as they aren't asked to perform obstacles which could be too challenging for them. What about handlers...is there an age limit for people? Can my son or daughter bring our dog to agility class? Junior handlers are always welcome at Startline. Kids are often particularly good students and can have a whole lot of fun running with their dogs. They do need to be old enough to stay focused for an hour during class and a parent or other responsible adult should be present while they are in class. At Startline, there are students of all ages, from 9 to 83 years old. My dog is very timid around other dogs and people. Can he still go to agility class? Absolutely. Many a shy dog has gained a great deal of confidence through the "game" of agility. You will probably need to go slowly and allow your dog to get used to the experience, but if you follow the advice of your instructor, you will most likely be very pleased with the results. If your dog gets very defensive when he's nervous, you may need to start with private lessons and work up to classes as he gains confidence and coping skills. Some dogs don't ever become confident enough to work in a group class, but this is quite rare. Even so, they can gain confidence and have a great time through agility training. What happens if I have to miss a week in a group class. Will I need to find a new class to enroll in or will I be able to come back the following week? If you have to miss a week of class, you will be missing some new training but you'll still be able to come back to class the following week. Since different dogs learn at different rates, we are constantly going back over behaviors and often dogs are working at slightly different levels anyway. Even in group classes, the training is not exactly the same for all the dogs and since the focus is on having fun, there isn't a rigid schedule that must be adhered to. Is there a size limit on dogs in agility? Could my dog be too small or too large? Dogs of all breeds, ages and sizes are welcomed to agility training. The jump heights are changed according to the dog's size. There are often three different jump heights in a single class. Sometimes the jumps are also lowered to accommodate an older pet. 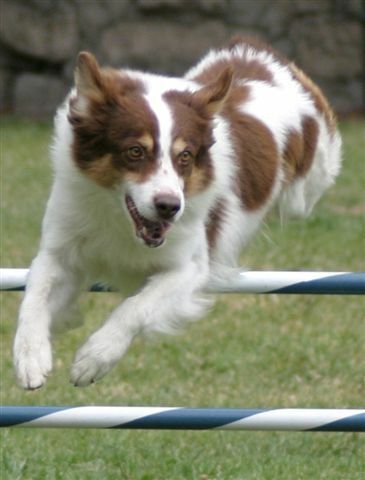 The large variety of dogs who can participate in the sport of agility is part of the fun. terrific outlet for their natural energy and exuberance. Some folks even think of agility as, "Disneyland for Dogs"
Even dogs who are shy around people or other dogs tend to "come out of their shells" when learning agility. Because agility is a social sport, dogs who exhibit serious aggression toward people or other dogs are not generally good candidates for agility class. Sometimes these dogs can be brought to private lessons. It's always a good idea to speak with us about your dog's temperament or behavior if you're not sure how he will react in an agility setting. The chances are good that we can help you to make an informed decision.